Much sought after especially with a strong rebirth of interest in knitting. Considered almost an inspirational work in the canon and it leads knitters to the unimaginable stage of actually knitting to their own designs. It could well be reprinted and there seems to be a growing clamour to get this done with some knitters petitioning S & S for a reprint. Ms Hiatt is apparently esp good on wools and yarns etc., The book is seriously discussed over at Library Thing. She is against circular needles, feeling they produce "barrel sweaters" - this is now considered an unfashionable view and these needles are popular. Some knitters consider Ms Hiatt dictatorial. However there are 80 people wanting this book at ABE alone. This is my favorite knitting reference book ever written, and this new edition with 100 more pages and revised material is even better than its original. 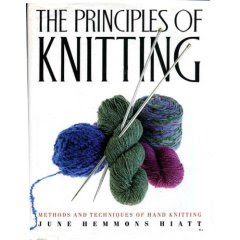 This book belongs in every serious knitter's library!